A federal appeals court rejected claims by the state and national Democratic parties that Arizona’s out-of-precinct and ballot-harvesting laws discriminate against minority voters, the latest step in a case that stretches back before the 2016 presidential election. (Photo by Miguel Otarola/Cronkite News). WASHINGTON – A divided federal appeals court rejected Democratic challenges to two Arizona voting laws Wednesday, upholding a lower court that said the rules put a minimal burden on voters and there was no evidence they were aimed at minority voters. He said that under the majority’s reasoning, literacy tests and poll taxes could stand, even though they disenfranchised minority voters, as long as they were evenly applied across racial and ethnic lines. Supporters of the law said it was aimed preventing voter fraud but critics said it will disproportionately affect minority voters, who often have a harder time getting to the polls and rely on someone else to deliver their ballot for them. 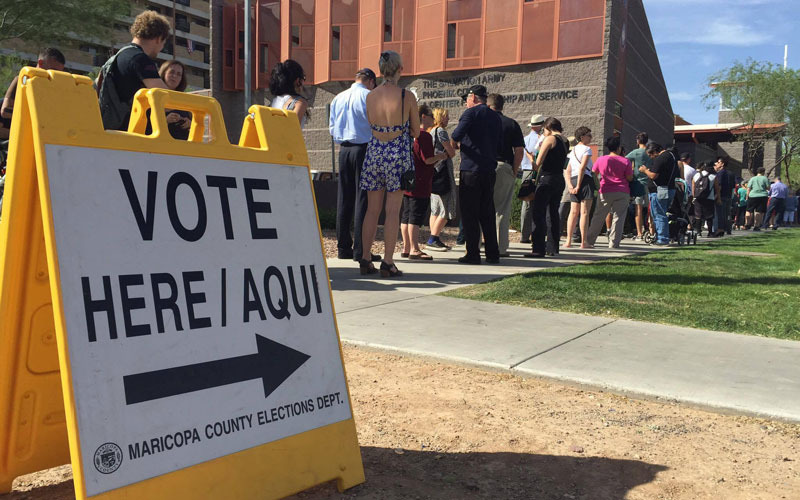 Alex Gulotta, Arizona state director of voting rights group All Voting is Local, said the state’s Native American population is particularly hard hit by HB 2023, since many live in rural areas where spotty transportation makes it difficult to deliver their ballots. The ballot-harvesting law was briefly blocked by courts in the week before the 2016 presidential election, with a series of back-and-forth rulings until the Supreme Court stepped in on the Saturday before Election Day and allowed the law to take effect. The case subsequently went back to district court where, after a 10-day trial that included 230 exhibits and testimony from 51 witnesses, the court ruled this May that the laws were not unduly burdensome on voters’ rights or made with discriminatory intent. The appellate panel agreed to expedite the DNC’s appeal of the case with an eye toward the now-looming 2018 elections. Out-of-precinct voting “is concentrated in relatively dense precincts that are disproportionately populated with renters and those who move frequently,” he wrote. He noted that Arizona throws out a far greater percentage of out-of-precinct ballots than any other state in the country, which he attributed in part to frequent movement of Arizona polling places, particularly in Maricopa County. “The paths to polling places in the Phoenix area is much like the changing stairways at Hogwarts, constantly moving and sending everyone to the wrong place,” Thomas wrote. Gulotta said he was “disappointed” by the decision, but not surprised in light of a 2013 Supreme Court ruling that loosed federal oversight of state voting laws under the Voting Rights Act. “It’s given much more freedom to states to exclude people they want to exclude in the electoral process,” Gulotta said. Neither side said Wednesday that they expect this to be the end of the fight.